Description: Map illustrating the Siege of Atlanta, by the U.S. Forces under command of Maj. Gen. W. T. Sherman. 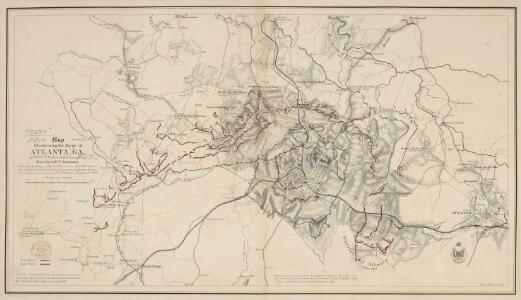 Produced by the Engineer Bureau for the Union War Department, this image is a Map Illustrating the Siege of Atlanta, Georgia by the forces of General William T. Sherman. Atlanta, a key communications and transport hub in the Confederacy, had been forced to surrender to Sherman following a five week siege in 1864. Many of the city’s buildings were destroyed, Confederate assets were seized and disposed, and the population were evacuated before Union troops entered. The destruction of Atlanta remains part of the cultural memory of the Confederacy’s loss during the war. The map shows the position of troops around the city, with the Union in red and the Confederates in blue.